I've been a long time fan of Miss Mustard Seed - I completely admire her drive and ambition and it's safe to say, she gets more done in one day than I do in a month. No joke. Her new book debuts this week and we're giving away THREE copies! Inspired You is full of beautiful pictures of Marian's home, her furniture, her original DIY projects and has the same enjoyable feel as her blog. In the book, she wastes no time and immediately gets to the meat of what she's about - teaching the rest of us what she knows. 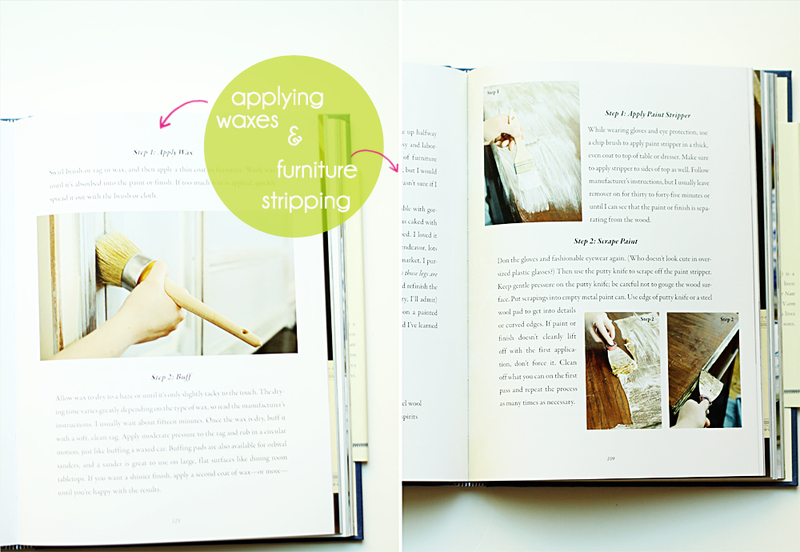 The book includes an endless list of step-by-step tutorials with plenty of pictures for those of us visual learners. If you're interested in learning the ropes of second-hand shopping, she has an entire chapter dedicated to antique stores, yard sales, flea markets, thrift stores and online classifieds. She even talks about dressing down to get a better price. "…people will quote a higher price for people who look like they have money burning a hole in their pocket." How have I never thought of that?! Marian is the queen of Milk Paint and has recently started her own line of colors. 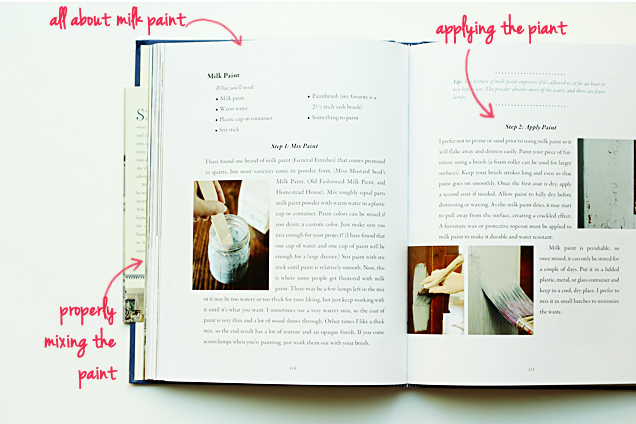 She dedicates several pages to both Milk and Chalk Paint. She covers how to use them, when to use them and how to properly apply them. "Throw out the notion that good design is expensive, must be carried out by a professional and can only be bought in a fancy store. I live in a real home on a thrift store budget and have never taken a design class in my life." If you're interested in winning one of THREE copies, just leave your comment below! The giveaway will close next Monday 11/12. I love her blog and I'm so happy for her. Can't wait to read her book- thanks for the giveaway! What a great book! I'd love to read it. I would REALLY love to win!!! I love her blog, and this book is on my wish list! I just found a great new blog, thank you! I'd love to read her book! Oh how awesome!!! I need to get her book, I love Miss Mustard seed. Thanks for the giveaway! Yes I want to read it! 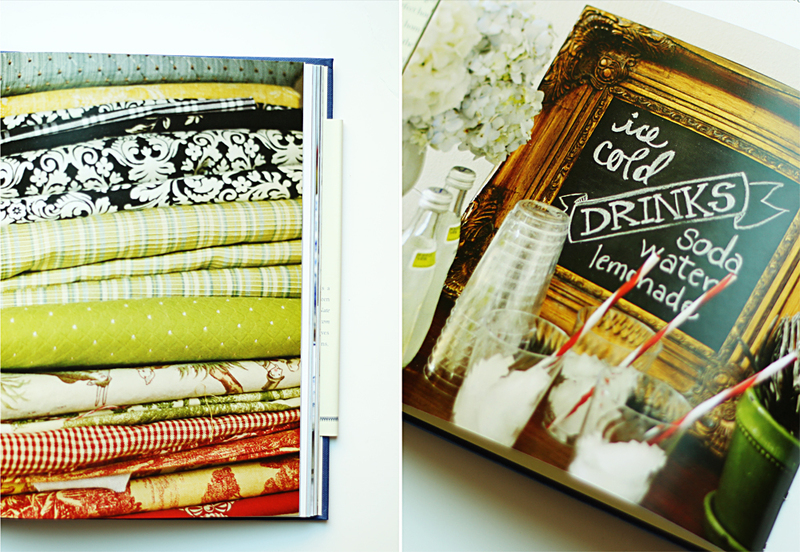 Who doesn't want another great decorating/pretty coffee table book? Thanks for the fun giveaway! I love Miss Mustard Seed! She is so creative and her style speaks my language! Would love to win a copy of her book! How exciting! Would love to have a copy! Couldn't agree more. Good design does NOT have to be expensive, does NOT have to be done by a professional, and does NOT need to be purchased in a fancy store. Having raised three sons in average home and on a thrift store budget, I'm proof of that myself. I Ms. Mustard Seed's blog regularly, and would love the chance to read more of her wisdom via her new book! ohmygosh.....I would LOVE to win a book!!! She is AWESOME! I read her page religiously! ...and you are awesome too, for hosting a give-away! Thanks! The book looks amazing! The photos are great!! Me, I would like to win a copy! What a great giveaway! Thanks for a chance to win this book! Would love to win the book! I'm sure it is filled with great tips, just like her blog! I would love to win a copy - I met here in Atlanta this summer and was thrilled. Thanks for the opportunity. Thank you for the chance to win this book! It's on my wish list, and I've been inspired by Miss Mustard Seed on several projects. Blessings! Yes, Yes, Yes! Thank you for the opportunity to win! I am design blog junkie and you have showed me one more blog to love and read. I am beginner at this whole thing, so woud love to gt the book and step by step directions. She is such an inspiration to all! Thanks so much for a chance to win her book. Very cool giveaway - I would love to win! Sign me up! I would SO love to have a copy! I could really use the help since we're buying a new house. I have been waiting for this book to finally come out. I have followed her blog for such a long time and I am so in awe of her and her talent, as well as YOU! Thanks for the opportunity to win this book. A copy of this book would be amazing to win. I am very interested in her story! Thanks for the opportunity. Blessings. I've been waiting for this book release! Thanks for the opportunity to win it. I would love to win a copy of her book. She's amazing! Looks like a wonderful book... Thanks for the opportunity to win it! Great giveaway Natty! Would love to add this to my collection! What a fantastic giveaway, the book looks great! I would love a copy! Your style and hers are great, thanks!! I'd love to win! Thanks for hosting this giveaway!! Oh how I would love a copy of this book! I am atempting the 'upscale look on thrift store budget' but it does not come as naturally to me. Fingers crossed. I was going to order one,but I will wait now and see if I win. Here's hoping. I love Miss Mustard Seed and would love to win her book! I'll throw my hat in the ring for the chance to win one. Thanks for your blog and this giveway opportunity! I would love one! Looks beautiful! I am dying to read her book. I enjoy reading her blog and I also like to read your blog and the tips you share about painting vintage furniture. Thank you for the give away. I have been looking forward for the release of this book for awhile now and so this is definitely an awesome giveaway I would like to win. Love giveaways! This one's right up my alley! would love to win a copy of Miss Mustardseed's book! Love ther blog and oh so simple tutorials! Oh my goodness! Those pictures are gorgeous! I love Miss MS. She inspired me to beautify my home. Sounds very inspiring, I would love to read the book, count me in, please! Looks great! I'd love a copy!! Thank you so much for the offer! I'm in! Have followed her for a long time. What an inspiration she is! Would so enjoy her book. Thank you for the opportunity. I've been following Miss Mustard Seed for a while now and actually grew up in the school district next to her's .... I'd LOVE a book!!! Oh, it looks like a fabulous book! Book sounds wonderful! Thanks for the giveaway! Oh I sooo want to read Marians book, Inspired By You. So kind of you to host this giveaway! 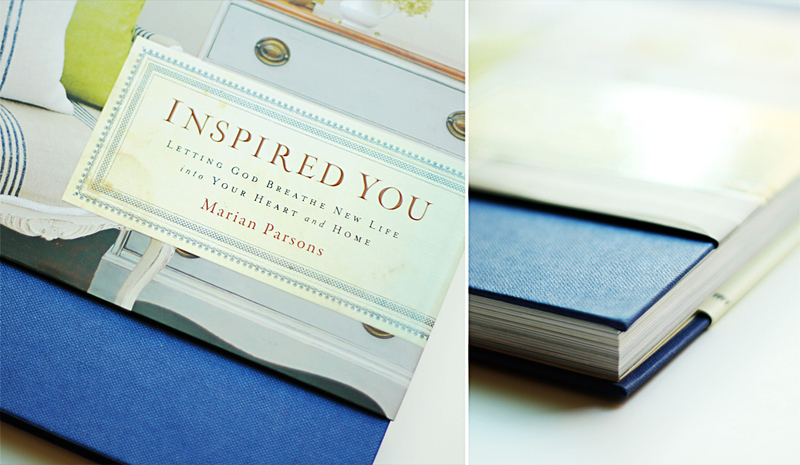 I would absolutely love to win a copy of Inspired You. Marian's blog has really been an inspiration to me and watching her journey into success has made me feel so encouraged and like I can be there someday also. I love Miss Mustard Seed, too! I adore Miss Mustard Seed! She inspires me and makes home decorating look so less intimidating. I would love to have a copy of her book to see if I could be even an inch as creative as she is!!!! Count me in!! I need all the style help I can get! Love it. Thank you. Thanks for the chance to win. This book looks amazing! I would love one! gee, i hope i win!! thanks! I would love to win a copy of Marian's book! Looks like a beautiful book and a great source of tips, info and inspiration. She is such a talented lady. It's been fun to watch her follow her dreams and I admire her endless energy. Thank for the opportunity on your giveaway! Marian sounds like a woman after my own heart! Would love to get my hands on a copy of this book. I love her blog and would love to have a copy of her book! Would love to win a copy of this fabulous book! How exciting! Thanks! Would love a copy. Going to be trying one of YOUR paint techniques this coming week on my daughters dresser - fingers crossed! I love Miss Mustard Seed! I would love a copy! Oooo ooooo. Pick me! Pick me! What a cool giveaway and a beautiful book! Would love to win this book!!!!!!!!!!!!!!!!!!!!!!!!!! I would super love a book! I could stand to get more done in my days. And I would love some Miss Mustard Seed inspiration! I would love a copy of this book! I WAYYYY overthink design...therefore...my home is designless :-( Something I hope to overcome in 2013 so that my home can truly be an expression of our life. I would love a copy! Sounds amazing! However, I am in Canada (Montreal)-can I still participate in the giveaway? thanks! Pretty please, with sugar on top!! I love her milk paint colors. Wish I was a brave furniture painter like Ms. M; maybe reading her book would help! Thank you. What a beautiful book. I would love one. Thanks! 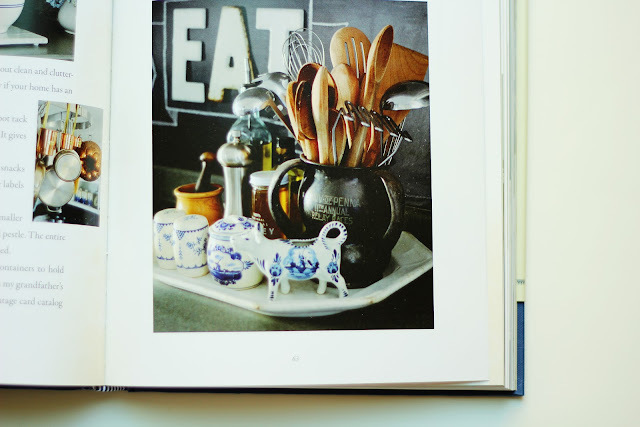 what a gorgeous book - would love to win! thanks for the giveaway! Maybe her book will give the courage to try some painting. Would love to win it. Yes, please! I love to see some of my long time favorite bloggers getting print deals, MMS, YHL. You next? This is so perfect for me! I love doing things myself and would love to be inspired by this book! I love her blog so I would be thrilled to win a copy of her book! What a great give away. Thanks! Looks awesome! I"d love to win! I would love to win a copy! Thanks! this book looks fabulous...i'd love to win a copy. thanks for the great giveaway! I Love Miss Mustard See! I would love to win a copy of her book. Thanks Natalie! I love her work! Would love a copy! Ooh I love Miss Mustard Seed! Found your site via Miss Mustard Seed- and I love your tutorials. I really am looking forward to checking out her book- crossing fingers. How can you not love Miss Mustard Seed??? i would love to get a copy of that book!! I really want one too! I would love to win a copy of that book. It looks great! Oh my goodness, yes, I most certainly would love a copy! : ) Thanks so much. Looks like a great book. I'd love one! my father recently passed away and now I have quite a bit of vintage furniture...some antique.... a bed similar the twin you just painted "old navy"...dressers.... this would be wonderful to help me re-purpose the items. I really admire Miss Mustard Seed for her work ethic as well. All you girls are amazing! Her book looks lovely. Thanks for doing a giveaway. I would love this book. What a wonderful giveaway. I have never asked for a book for any birthday or Christmas.This is the one book that I'll be asking for this year.Hope to win !! I hope this isn't closed yet.... I'd LOVE LOVE LOVE to win her book!!! I have admired Marian for a long time, she's a fantastic designer. Just bought her paint for the first time! It's on it's way to me in Hawaii. Would love to have her book too! Ooh! I'd love a copy of this book! Thanks for the chance to win! Awesome! This book sounds great, and just moved into new house needing design support! Thank you! I hadn't heard of this book yet so I'll have to check it out. Thank you for the giveaway! So excited about this book! Love all your furniture sharing too! I've just recently discovered Miss Mustard Seed, but she has gorgeous taste!